There are 22 comments for this item. Freddo30, Thanks for the memory jog - I remember those 5-piece chalk holders for music class. Thanks, "CJ" for your suggestion for a new handle. Here in my area of London, Canada, some of the retail pharmacies consider an individual a "senior" when they turn 55 years old. I am 53 in June so...I don't know if I can live up to the title of "young whippersnapper" for long. I am happy my anecdotes are entertaining. This is a fabulous group here. I appreciate everything our webmaster "Mr. Duff" does to support this amazing webpage. So, CJ, you were in the Airforce in 1969 were you? Of course, my favourite subject is history and I bet you have some interesting anecdotes to share about your time in the service during that era. Best wishes for success to everyone. Read you all again soon. @Duff - The smart ones (future PhD's) still skip grades but I doubt if anyone is held back any more because it would be pointless. Little Johnny or Mary cries to mommy & daddy - they in turn raise hell with the school for hurting their "little babies" feelings so the kids get a free pass anyway. Hey, do kids ever skip a grade or get "held back" anymore? Do I need a separate item for those practices? This is all about ancient anecdotes. Thank you for sharing. As a professional musician I cringe at the thought of laying a strap across a student's hand, The human hand is a miracle of delicate biomachinery. I did manage to get rapped on the knuckles by an old Irish nun. She ignored my loud protests of absolute innocence. Yeah, I lied. We were playing TARZAN in a neighbor's bushes. Ok. I might as well weigh-in with my ancient anecdotes. School year was 1969. I remember it well: Mrs. Tansley. I respect her now. Then...the class witnessed one of our classmates receive the business side of an old wooden coat hanger - nice swing across the buttocks which would have impressed any tennis star - the hanger broke in two pieces like match sticks and the recipient looked up at her with a grin, and Mrs. Tansley asked him, "...do you have a set of books down there..." Maybe the Cracker Jacks were fortified with iron then. Ah yes, those were the days. 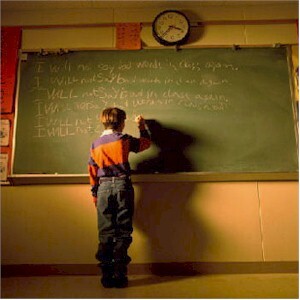 One of our members mentioned cleaning the blackboards: Staying in the year 1969: I was a "good boy" and never stayed after school in Grade 1, however, I used the blackboard cleaning after school duty as an "excuse" to explain to my mother why I was late arriving home from school. I was visiting with my classmate, Debbie, who I had a "crush" on. Too shy to even blow her a kiss. Somebody mentioned receiving the 3rd degree from parents when they learned we misbehaved at school: fast forward to Grade 5 (1973/4): I told my mother I had an argument with my teacher at school, and I refered to Mrs. Thompson as a particular so and so similiar to a specific historical figure who held the rank of corporal during WW1 and sported a unique moustache, you know who I mean. Well, as I recall, not a good idea: forgetting my mom grew up in Germany during WW2, et al. My mother used to say, "...you just wait until you father gets home from work...!" Sure, mom, so he can apply first aid. I am kidding of course. But, my mother was the "disciplinary." I darkened the office door of, Mr. Dark, our principal during my Grade 5 year, yes, that was his name, and we anticipated a black moment when the strap came down on an open hand. He was violent by Stephen King standards, but, not because it hurt the recipient - he would physically shake to work up the stamina to deliver what he considered a lethal blow to our hand. Poor fellow. The difficult part was trying not to turn our frown upside down. We were good actors. I too witnessed some unnecessary violence exacted by teachers on students which I won't illustrate here, but, should they bring back "corporal" punishment? I think it depends on each situation and the perpetrator of "the crime." I spanked my children once, yes, ONCE and they grew up to be "well-rounded" adults. I enjoyed reading the member's stories. Thanks for reading my long post. Yeah! Thanks for the memory. The old desks had inkwells here in Texas too. Some of the guys delighted in dipping pigtails and pony tails in the ink to the chagrin of the girl seated ahead. We walked to school barefoot in jeans and a T-shirt. The janitor's red wax attracted dirt. The soles of our feet were black. "Don't you dare come in this house with those dirty feet!" Went I first started school here in Canada back in 1958 all the desks still had round holes for inkwells and sometimes the teachers actually provided the little squarish ink bottles of blue-blck ink to use with the scatch pens to write with! The ink was so messy if you got it on your hands even some on your clothes unitentionally. @speedstick77 - Here is a good example on why we are dead last in math & science - A school where my son lives has made Math an elective and Spanish will be required. So Sad! Staying after school was a pleasure in elementary school ; I loved washing (not merely erasing) blackboards (green boards), wiping down chalk trays, taking erasers to the great canister vac down the hall, and especially repairing the pencil sharpener by dumping shavings and removing tip shards from the mechanism...and the wonderful 5 piece chalk holder for staff drawing in the music room. My 4th grade teacher sensed my Virgo neuroses and constantly reminded me ..."that's good enough, now, (my name)"
"Y'all cain't make us do nothin." They were right. Helicopter parents rule the schools. I had a sadistic science teacher in 1968-70 who had a competition with the other science teacher to see who could "whack" that most students. He also cheated at track meets by renaming ineligible students and placing them in competition. He threw erasers at students and dumped them out of their seats. The guy would be arrested today and held for assault with good cause. Not to mention the civil suits. It was worse if word got home...no parents taking the side of the kid....you got whacked twice as hard at home. Speedstick things have changed a lot in the last 70 years. Antispanking zealots pretend to have higher moral ground. "Spare the rod and spoil the child" has stood for over 3,000 years because it works. The current generation shows little respect for anything. There is never cause for one human being abusing another. Revocation of privileges worked for me. It's a shame that these aren't used in school anymore ... kids get away with murder now-a-days, if you ask me! Nope. My nickname at school was "Spanky" and sometimes "Buckwheat". I was never good at keeping a poker face. I laughed. That encouraged their bravado. That is a fun generation. So, is that how you got the handle "speedstick"? I was a new teacher when the boomers were in high school. The shop teacher made me a real nice paddle. The guys ran races to see who could get the most licks in one semester. A football player racked up 159 and bragged all over school. I helped run up his score. 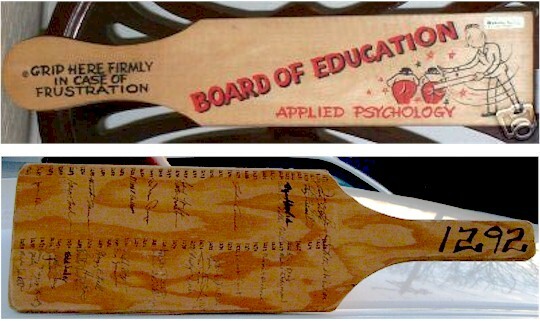 The top model of paddle shown here is the type that salesmen of wood products, such as school desks, rulers, pointers, window poles, etc., would give to the principal as a "door opener" or goodwill gift. The second, simpler, style was usually made by boys in wood shop. Ironically they took pride in their craftsmanship, when one considers the purpose for which their handiwork was intended. Those who were awarded a swat(s) had the privilege of signing the paddle. There is a third type with holes drilled through the business end, scientifically calculated to improve the aerodynamics of the paddle so that it struck without the impact being impeded (or cushioned) by a layer of compressed air. It seems rather severe but from what I gather it was in wide use. This type of persuasion was typically used on boys but I know a mother-daughter pair from Idaho who have a story of their school days. The country schools still had teachers in charge of more than a single grade in those days. The girl's mother was a teacher and she warned her daughter upon promotion to one of her classes that if she misbehaved, she would have to be harder on her than the other students to avoid a charge of favoritism. This teacher never gave more than a single whack but she gave her daughter such a powerful smack that she broke the paddle.